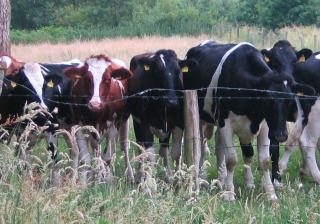 Melantrys’ Page » Blog Archive » Save the cows!!!!! This entry was posted on Wednesday, November 14th, 2007 at 12:15 am	and is filed under boring work story, freaking morons, Huh?, photos, funny. You can follow any responses to this entry through the RSS 2.0 feed. You can leave a response, or trackback from your own site. So a native German speaker asked for cow mulch when they actually meant bark mulch? Were they from Bavaria? Over here in the U.S. cow mulch is called hamburger. I used to love to eat grilled cow mulch! Haven’t eaten it for years though. Some idiot from Texas (there are a lot of idiots from there!) came up with the bright idea of feeding cow mulch to cows. The Texans then outsourced the idea to England where multiply recycled cow mulch was fed in mass quantities to English school children. 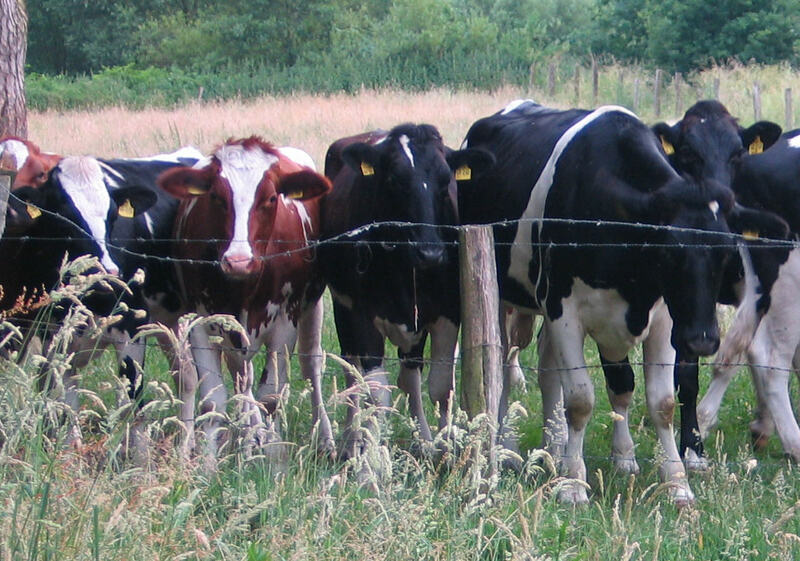 Well anyway, your German cows in the picture look like happy cows. At least they get to live outside and eat grass. Over here there is a TV commercial for a chicken restaurant. It shows cows holding up “Save the Cows, Eat More Chicken” signs. @David: Without having seen or heard those customers I can say: No, they weren’t from Bavaria, they were from the region where we live. Mafdet, I was just making a little joke about Bavarians, as I know how much Mel hates them. In Alabama, where I mostly grew up, there are a great many people who can’t speak either. They have their own dialect which is a mixture of hillbilly and redneck. They make really good cornbread though, and they like their okra crispy fried not slimy! Ahhhh, you mean it’s not just Americans who are language challenged! Thank God! P.S. Haloscan ate my cookies. @ David: Bavarians don’t speak German. I’d have phrased things differently then. But I was talking about native German speakers, yes. Foreigners learning the language would have had an excuse. Native speakers just don’t. No, no, the Brits are more “famous” for feeding Scrapie sheep mulch to cows…. I think the cows were more bewildered than happy that afternoon and definitely wondering about the weird noise. (We were playing metal and punk tapes on D.’s infernal car battery powered stereo.) I think they came to spy on us. @ Mafdet: Well, I just had to let it out. They make that mistake so often…. @ David: It’s no quaint rural dialect. They just don’t know how to speak German. @ Lynnette: No, the people around here are very challenged too…. I thought Bavaria was in Germany. If Bavarians are Germans, why don’t they speak German? Are they like French speaking Canadians who live in Quebec? Quebec nearly seceded from Canada over their language and cultural differences. Do Bavarians want to be independent also? What?!! You love crispy okra?!! You never admitted that before. Happy Thanksgiving Mel! I hope you have all the stuffed okra you can eat! Do they make soy turkey? Is it Thanksgiving over there? soy meat. Wheat meat is the thing to eat. Damn, I started on Damascus pt2 yesterday (slow start, no reason to form queues yet), and thought I’d have ample time to continue today, but I think I am sickening for something and feel feverish, so no work. Brain is derailed.